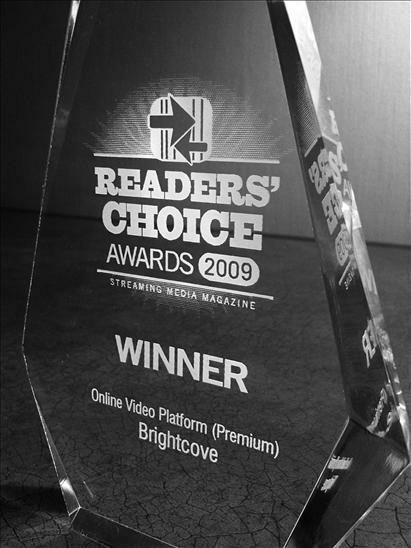 We are very pleased to report that Brightcove was chosen as the best premium online video platform by the readers of Streaming Media magazine as part of the 2009 Streaming Media Readers' Choice Awards. The third annual Readers' Choice Awards were presented last night at Streaming Media West. According to Streaming Media, this year's awards were the most popular to date, with more than 5,000 votes case for more than 200 products, companies and services. Brightcove was up against two other organizations in the premium online video platform company, but came away with 31% of the votes. We are extremely honored to be chosen for this award and to be recognized by the great readers of Streaming Media, as they are the ones who use our platform day in and day out to deliver the highest quality online video experiences possible.